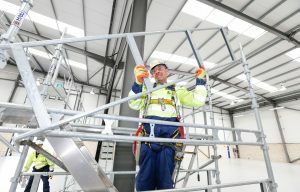 HAKI’s CITB-accredited scaffold training centers provide a comprehensive range of courses, ensuring that the stringent health and safety requirements for workplace access and working at height are met whilst operating with HAKI components. Courses include both theory and practical ‘hands on’ training. Successful delegates of the CISRS SSPTS course are provided with a CISRS Completion Certificate together with an endorsement on their CISRS card. Successful delegates of HAKI product specific courses receive a HAKI Certificate and Photo ID Badge. HAKI now offer a ½ day Manual Handling training course at our Milton Keynes training centre. All attendees will receive a Certificate on successful completion of the course. The cost is £40 (+VAT) per person or £30 (+VAT) per person if you are booking and attending another training course. Please contact training@haki.co.uk for further information. Click here to book training at a HAKI scaffold training center. Be the first to get the latest news, updates and special offers from HAKI! If you want to send HAKI a message without searching for a direct contact, great! Please use the form below, which will be passed onto the right member of our global network.